The MAC lipstick counter was always a bit overwhelming to me - so many colours and finishes to choose from! 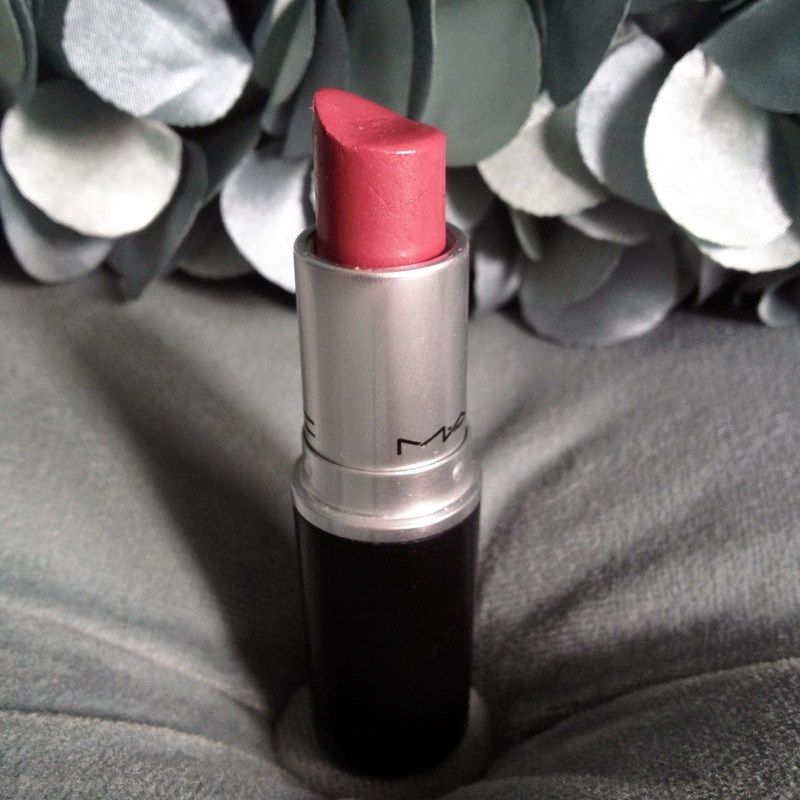 The huge selection is one of the reasons I imagine MAC lipsticks have such a cult following in the makeup and beauty world. I have 5 MAC lipsticks to my name, which may not be much to some collectors but it's enough for me (for now...), and I love each of them oh so much. All of my MAC lipsticks are from the permanent collection and come dressed in their sleek, sophisticated classic black bullet and smell deliciously like vanilla mmmmm... They retail for $19 CAD each. 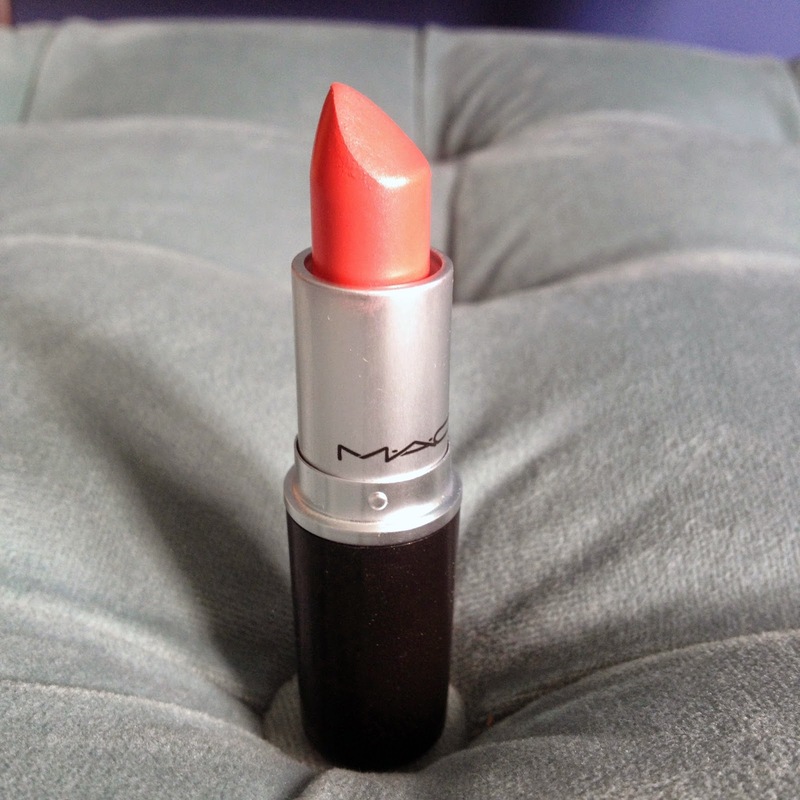 My very first MAC lipstick ever was Chatterbox, an Amplified finish. It's a bright warm-toned pink lipstick that applies very opaque and smoothly. I love this colour for summer because it looks nice with gold and tan tones. However, the Amplified formula, though it does apply beautifully, can emphasize dry skin and fine lines on the lips so make sure you exfoliate with this one! Spice It Up! is one of my must-haves for Fall/Winter - a warm spicy brown-toned red with a Lustre finish. The semi-sheer, glossy Lustre finish is what makes this bold colour very wearable for day, in my opinion. It doesn't apply too bold but is still richly pigmented. It can apply a bit unevenly at first, but this is lessened if you wear a balm under it. Peach Blossom was originally launched in a Limited Edition collection but has recently been brought out as part of MAC's permanent line - lucky us! Peach Blossom has a Cremesheen formula and is one of my go-to everyday neutrals. 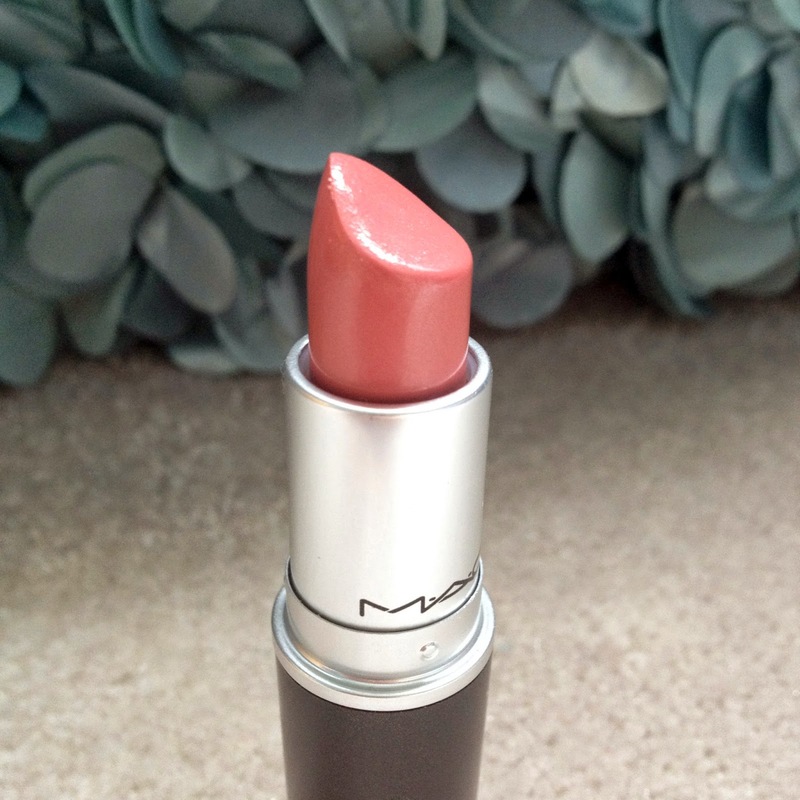 It's warm and, as the name would suggest, peachy, a nice "my lips but better" shade for spring. Costa Chic is one of my go-to summer lipsticks - and apparently many other people's as well! Despite being part of the permanent line, it took me forever to get my hands on this one. It was always sold out at every MAC counter I could get to. It's my only Frost finish MAC lipstick but it doesn't wear in any way I would describe as "frosty". The sunlight brings out a bit of the metallic/shimmery finish but otherwise it just reads as a creamy, orangey coral that brightens the skin and really complements a tan. 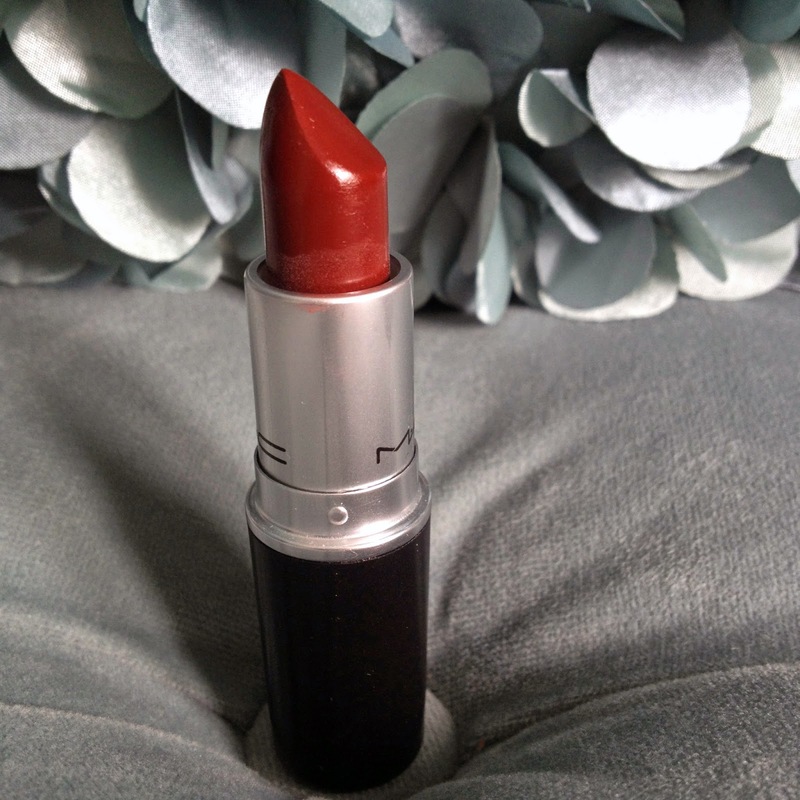 Last but not least is my absolute favourite MAC lipstick and one of my most worn lipsticks ever, Syrup. Syrup is a mauve-toned neutral that's very flattering, especially on pale skin. It's a Lustre finish, so it's fairly glossy and smooth and I loooove it. I must have this one with me, always.